Property damage from the Carmel fire is estimated at 120 million, fear that approaching storm will cause flooding, erosion. PM to expedite aid. Finance Ministry experts have estimated the total cost of damages done by the Carmel fire at 120 million shekels. The figure includes damages to property and infrastructure, and does not include damage done to forests and other natural areas. 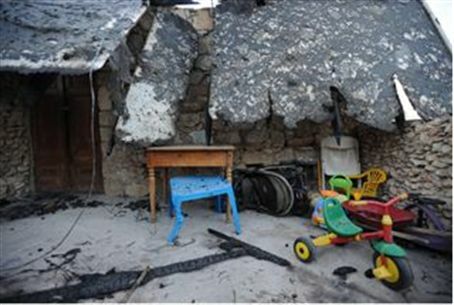 An initial study found that 50-60% of the damaged property was insured. The ministry has given 2,500 shekels to each person whose home was destroyed by the fire, in order to allow them to buy basics such as clothing. In addition, 25 million has already been allocated to fix damage to the sewer system. Prime Minister Netanyahu has requested waiving of bureaucratic government tender procedures to expedite repairs. The government has taken a variety of other steps to provide quick help for fire victims as well. Residents of the Carmel region expressed concern Friday over reports of an approaching storm. Weather forecasters predict rain and wind on Friday and Saturday, particularly in the north of the country. It is feared that those areas scorched by the fire will be at risk for flooding as the ash and soot that remain will prevent water from being absorbed by the earth. In addition, rain could cause erosion of the topsoil due to the fact that in some areas, even the roots of trees were burnt by the fire. Fire and Rescue Services workers in the region are on alert for floods, in case they are called on to conduct evacuations or rescue operations.